Sally Owen loves pink so much, she painted her terraced house in one of the brightest shades of the colour. She's known as "Pinky" to locals and children often stop to have their picture taken outside of the house in Linton, Derbyshire. "You've got to put a bit of colour in your life and mine is just pink," she said. It's not just the house that is pink. Mrs Owen has a pink car, caravan and plenty of the colour in her garden. "I always wear pink. Everything's pink," she said. "It's just my favourite colour. I've got a vintage caravan that's pink, it's all pink inside. "There's nothing wrong with it." Pink is a real obsession of Mrs Owen's. Her favourite food is prawn cocktail, her favourite film is the Pink Panther, she drinks rose wine and her most loved icon is pop star Pink. Mrs Owen, 48, says she hasn't had any complaints from her neighbours and says children pass by her house saying "there's Barbie's house and Barbie's car". "It just gives them a smile," she said. 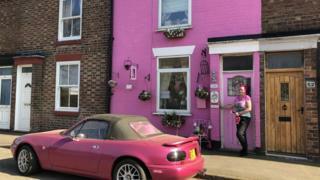 Image caption Mrs Owen said "there's nothing you can't do with the colour pink"
She said her partner Jason Dodds, a bus driver, loves pink too so doesn't mind the house's colour or contents. Outside, Mrs Owen also has a vintage pink caravan called Louisa, a pink shed and pink chicken house. She says she got the shade specially mixed in masonry paint at a DIY store but is now desperate to repaint it again in pink - but with added glitter this time.